Floyd Mayweather has caused a stir lately by claiming, yet again, that Manny Pacquiao could not possibly have risen through as many weight classes as he has without chemical help. And yet — a simple analysis of the two fighter’s rise in weight over the course of their respective careers shows that Mayweather himself has risen just as much as Pacquiao has–the main different being simply that Pacquiao started earlier in life as a professional. The following chart correlates the two fighters. 1. That Mayweather is so stupid that he doesn’t know that a simple analysis like this refutes his entire argument. 2. 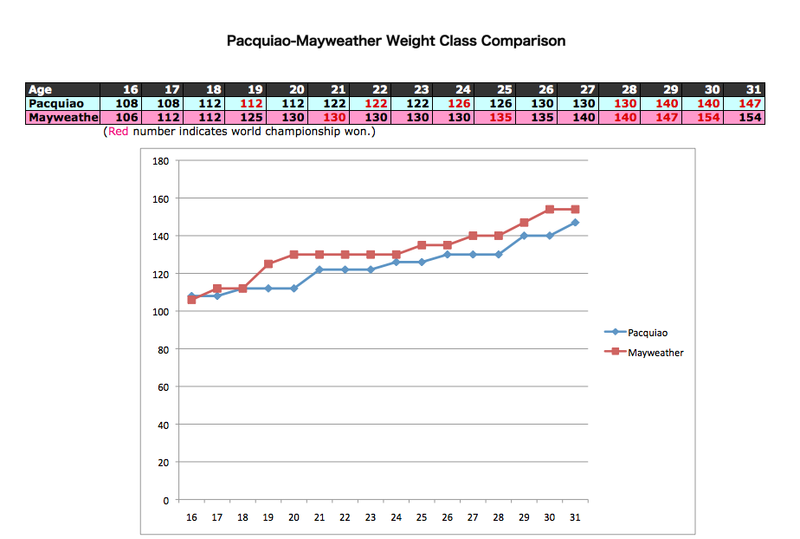 That there aren’t hundreds of charts like this floating around the boxing blogs and sports outlets. How can the world just let Mayweather get away with this kind of garbage without calling him out on it. In the past, I’ve not ranted — it’s not my style. But this time, it deserve a rant. Wake up, people. It’s simple math. The info that went into the charts came from a nice bit of analysis done by Jake Eman at ProBoxing, and I think him for doing to research to come up with the numbers. All I’ve done is put everything onto a graph so that you can see Manny’s history superimposed over Mayweather’s. I love what it shows. (Click on it to enlarge and see full-sized version of the chart). The reason Mayweather gets away with making claims about Manny is generally that he started his own professional career at 130 lbs — but then he was 19, going to 20, when he did that. He fought at 108 when he was 16, just like Pacquiao did — only Mayweather was an amateur at 16 while Pacquiao was already a pro. It’s interesting to also consider what’s happened to Manny at the highest weight classes in terms of his punching power. The last time he landed a devastating knockout was at 140 against Ricky Hatton. At 147 against De La Hoya he was devastating but didn’t even knock ODH down — he just cut him to shreds with jabs up the middle until Oscar said “no mas” and quit on his stool. Then it was Cotto — a great fight, but a 12th round TKO that came about as the result of the accumulation of Manny’s punches. Then the Clottey Turtle Show which didn’t prove anything but definitely didn’t result in a knockout, and finally Margarito. All of that is consistent with Manny being a natural 140 pounder, and fighting one to two classes above it he’s not a devastating power puncher but rather has to wear down the opponent.